Home > Getting Started > Tennis, Badminton or Squash? The majority of people who take up one particular racket sport do so through peer pressure. And that's only natural. 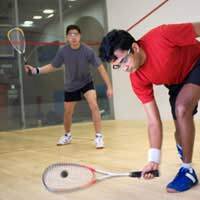 If your friends or work colleagues are heading off for a lunchtime foursome of badminton, or meet up for a regular weekend game at the local tennis courts, then not only is this a more convenient way to pursue interest in a particular sport but it provides a social aspect that means it is more likely you will continue playing rather than lose motivation. Another factor steering you in the direction of one sport is childhood experiences. This tends to mean most people opt for tennis or badminton, as squash has always been the junior partner. Why is this? Well, in the main it is due to the relative lack of media exposure that the sport has enjoyed during the course of the past 30 years. Tennis, of course, is one of the televisual big hitters, while badminton has managed to get its foot in the door of the Saturday afternoon schedules. By comparison, squash is relatively neglected, which is strange given the drama and intensity of the sport when played at the highest level. Coupled with this low level of exposure is the relative lack of facilities to play squash. While those of a certain age will remember inhabiting the municipal tennis courts during Wimbledon fortnight 20 or 30 years ago, squash has never been able to stake a claim for those childhood memories that can spark renewed interest in those in or entering middle age. A third reason why squash is often overlooked is the perception that it is very much a challenge for those possessing high fitness levels. Certainly the enclosed nature of the sport adds to the perception of its intensity, but the idea that over-stressed executives are keeling over on court on a weekly basis is a myth. All sports require a certain level of fitness, and those intending to take up squash should take account of this before picking up a racket. Nevertheless, the idea that, by comparison, tennis and badminton matches need only consist of genteel dinks over the net is laughable. You only have to stand courtside at any sport centre across the country to hear the muffled curses and cries of frustration, to realise that whatever the individual ability, competitiveness and effort are never lacking. If you are undecided about which racket sport to choose, why not head off to your local sports club or gym and enquire about taster sessions. It may well be that you envisaged taking up tennis but find that badminton or squash fires your imagination. Whichever path you take initially doesn't preclude you from changing to another sport along the line, or even playing more than one on a regular basis. All three main racket sports require the aforementioned fitness along with good reactions and racket handling skills, so improvements made in these areas playing, for example, tennis will not be lost should you subsequently decide squash or badminton is the arena in which you want to concentrate your efforts.